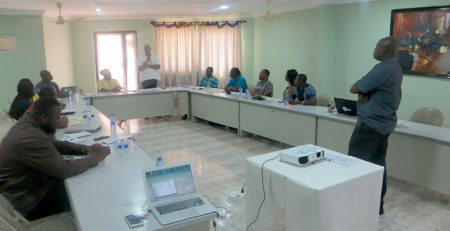 The Society for AIDS in Africa (SAA) on the November, 2018 received Youth delegation from Ghana, Togo, Cote D’Ivoire, and Mali at its permanent secretariat located in Accra-Ghana. The youth delegation came for a meeting with ICASA International secretariat to discuss strategies for the upcoming ICASA 2019 youth programme, so it reflects the UNAIDS global 90-90-90 targets. The Director of ICASA 2019/Coordinator of SAA, Mr. Luc Armand Bodea drew the attention of the youth to the current rate of the HIV/AIDS pandemic: The majority of young people living with HIV are in low- and middle-income countries, with 84% in sub-Saharan Africa (UNAIDS 2017). In 2016, 73% of new HIV infections among adolescents occurred in Africa. The number of adolescents dying due to AIDS-related illnesses tripled between 2000 and 2015. At such an alarming rate, SAA together with Youth delegation as well as others from Rwanda, Zimbabwe and France, proposed ways for better visibility and ownership of youth programme at ICASA 2019 Rwanda.